Melt the butter over medium heat in a cast iron skillet. Add the frozen peas and carrots and cook for three minutes, to thaw the vegetables. Add the deboned chicken to the vegetables in the cast iron skillet and cook for two more minutes. Sprinkle four Tablespoons of flour over the top of the vegetables and chicken and then mix it all up. Add half of the chicken broth to the cast iron skillet and stir. Cook until the broth begins to thicken. Add half of the heavy whipping cream and stir to combine everything. Cook another minute or two to allow the sauce to continue to thicken. Add the rest of the chicken broth and continue cooking to thicken the sauce. Add the salt, pepper and thyme to the skillet. Add the rest of the heavy whipping cream to the skillet and stir to combine everything. Cook for two more minutes to allow the sauce to thicken even more. Unroll the Crescent Rolls and place them, one section at a time over the top of the mixture in the cast iron skillet. Place the skillet on the lower rack in the oven and turn it to 350 degrees Fahrenheit. 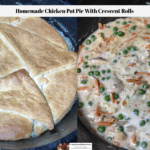 Bake the chicken pot pie for 25 minutes. If the crust is not golden brown, continue baking for another 5 minutes. Remove the chicken pot pie from the oven. Allow it to cool for five minutes and then serve it.